I haven’t consulted the map. I didn’t know there was a map until after they returned to the car at the beginning and spread it over their laps. I know I am trying to get to the magnified view as indicated. I will have to go through many rooms. In some cases I might have to stay overnight. It all depends. In a narrative that is about an underground replete with unspoken dynamics that are probably sado-masochistic, the open field of the mystery is significant. The narrative is not master of its own mystery. The narrator is not in control. There is something going on in The Undying Present but it’s a secret. There is a necessity of uncovering the mystery, the structural body of the scene that can’t be addressed singularly by the author who is included in it. How are we going to be asked to question the surface? To get to the matter, when intimacy lapses. The reader is being asked to help. Narrative, one might argue, is as arbitrary as any other idea upon which to hang a story. Staiti’s narrator is not in control, they write, and yet, it takes a remarkable amount of control to allow such a space for the narrator to drift so artfully, highlighting a comparison and difference between this and, say, Richard Brautigan’s novel Sombrero Fallout: A Japanese Novel (1976), in which narrator, narrative and, supposedly, author erode simultaneously. Staiti’s montage of prose-sections accumulate in such a way that are reminiscent of the novels of Toronto writer Ken Sparling, yet writing out longer scenes than his novels often include. Both writers, somehow, manage to create full-length prose-works that suggest that the order of the sections aren’t fixed, but simply one way of reading; might The Undying Present be equally readable if the sections were re-ordered? Would it make for an entirely different, yet equally satisfying, experience? Staiti is also the author of the chapbooks Verse/Switch & Stop-Motion (2008), In the Stitches (Trafficker Press, 2010) and Between the Seas (Aggregate Space & Featherboard Writing Series, 2014), and in an interview conduced by Ariel Goldberg, Staiti discusses In the Stitches in a way that seems to connect to this current work: “There is some kind of world in which this language is existing but I don’t really know what it is. It’s partly an imagined/fantasized world but it steals objects and ideas from our world. I don’t feel so literate in this world at all. I feel pretty removed from it. In the earliest version, I was trying to write lines that would negate themselves. I wanted to see what something looked like if it could be itself and also its own negation. I was writing longhand, which I almost never do. As the piece over time transformed into this thing, I realized that something kind of ambient but real came out in the attempt to negate. I thought a lot about ambience. I wanted to see a world in which ambience dominated. 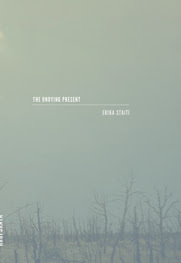 It’s interesting about the different voices you mentioned because I’ve been hearing it as un-voiced, as a humming or something.” In remarkably precise prose, Staiti appears very much to be creating a world through halved information, presenting just enough to create an incomplete portrait, and make the reader aware of what might be missing. One might say that this new work is just as much ambient than setting or narrative, suggesting what another writer would have fleshed out more fully, yet most likely lessening the effect. I walk through the City of Margins. Tall angular buildings shimmer in the sun. Dozens of people move past me walking in straight lines with conviction. I am moving in this way too. The streets push us to our destinations efficiently. We push ourselves there. A narrow alleyway appears. I turn and walk down the torn street. I reach an empty parking lot. I feel the Second City beneath me. The shell of a burned out car sits at the edge of the frame. An abandoned and deteriorating building sags into the ground. This is where we enter. I open the doors of the building and walk around peering in each room. The rooms hold remnants of the past, forgotten objects slathered in dust and rodent feces. I climb the stairs dragging knobby fingers over a dusty banister. A young woman is crumpled in the corner at the end of the hallway. Her body is a mouth, a dark open hole telling a story. Speaking not speaking.